I realise there have been times in the past when many of you have had your suspicions as to whether or not I'm a complete idiot, and I'm here to confirm that your suspicions are well founded. The plan for the day was to get to Amsterdam. Our visitors had been there the day before, and wanted to round out the visit and take in a couple more sights. Mind you, with roughly seven hundred thousand residents and seven million tourists going there every year, most of the "sights" is really just other tourists, but don't get me started. which is right there on the edge of the square but hey, I'm just the transportation guy. So I took the two of them to the Hengelo train station (again) for the 7:55 train (something like that) and off they went. Stopped around the bakery and then the Texaco station around the corner from the house to fuel up. That would be our car being loaded on the back of a tow truck, from one of the narrowest streets in Delden, as you can tell by the car squeeking by. Oh, and it's on a bus route too. What fun! At least that's what I tell myself. That and, "at least we weren't on the highway", and "at least nobody got hurt". It just so happened that one of our young passengers wanted to send off a couple letters back to Canada, so I figured we'd stop in town on the way and pick up some stamps, and get that sorted out. This was probably a good thing, since at least we didn't break down on the highway, or worse. Diesels don't run on gas. Now, much to their credit, the dealership had a car waiting for us, which I believe is made available through leaseplan (the company that provides our car) and we really and truly were on our way once again after say, a couple hours? So it ended up being a "half day in Amsterdam", but that's the way she goes. We'll probably find out today how much the dealership is going to put the bite on us for my boneheadedness. I don't think it'll be a nice number. But we'll deal with it. "It's only money"....."It's only a car..."
As we were back on the Snelweg (highway) I said to Gabe, "Y'know, I do find it amazing that you remain calm when I do these really stupid things from time to time..."
Suffice to say the rest of the day was pretty much uneventful. Phil and Betty managed to get their bank card issues sorted out, so that was a relief. It's important whether or not your card is linked to a chequing or savings,since none of the ATMs here let you make that choice, and that's about the extent of it. Pretty sure this bike has had it's picture taken a quite a few times, since I recognised it from somewhere on the net. Figured I'd take one more. Where I ended up parking was a bit of a hike, but unless you're willing to try your luck on a bike, it's always about the walking. Whatever we would have done without cell phones is a complete mystery to me, since the meeting time did get changed once or twice. Meeting up with someone in any big city can be a bit of a challenge. Originally I thought the title of this entry would be "Bob's bike tours ", but after getting just a tad too much sun yesterday, it's more about how I feel today than anything else. arrived without too much difficulty on Saturday morning at Schiphol. I say that, even though it did seem to take them forever to emerge, but then again, the airport has had to hire extra personnel this summer, since it's been a mad house there for the last month or so. Seems the recession hasn't stopped the Dutch from going "op vacantie". The rest of the day was more or less spent recuperating for all concerned, since I too had a brief rest in the afternoon after going to the airport for seven that morning. Sunday we decided to head out on the bikes, with the usual visit to Twickle, since it's pretty much the extent of the local attractions around here. We then came back through Delden, stopping at a bakery for lunch before heading off to Hengelo. By the way, this is one of the bakeries that I almost always go to on a Sunday morning for croissants, so it was a pleasant experience to be met with a couple knowing smiles when I showed up there again a couple hours later with an "entourage". This can trump the anonymity of a big city any day as far as I'm concerned. We later took a little detour through one of the streets here in Delden on the way out of town, since I knew that the houses were all very interesting. What I didn't realise was that among the many that have thatched roofs, there was one that was getting redone. This is a bit of a dying art it seems, and probably somewhat of a status symbol, since I understand it's a rather expensive proceedure. No sooner had we reached the "Hengelo" sign, when I heard some rumblings from the back of the pack, only to discover that the bike that Betty was riding was beginning to have some "issues". This is one of the bikes that we shipped over when we moved here, only to discover that it was was too small and uncomfortable for me, and is now used as a spare. It has also turned out to be one of the most unreliable pieces of junk I think I've ever owned in my life. But don't let me tell you how I really feel. ....which probably explains the way I feel today. Just as content to keep a low profile here at home, and let the travellers....travel. Don't mean to get maudlin here, but I've bought a few things from this place over the years, and even strolled around their Calgary location once a few years back, and now I see the recession has hit them a little hard. Well, either that or they did something really retarded. We'll never know. And maybe "a little hard" isn't quite accurate. It's more like....they're done. From what I hear though, the boom in Calgary has definitely taken a bit of a turn for the down side. This was one of the far reaching side effects. I was just going to do a little online shopping (well, browsing first, but who knows?) to break up the monotony, since I don't think the rain has stopped for one tiny second yet today. Gabe did manage to get to the car unscathed at around 7:30, but after that the sky opened up. Happily I stayed a little ahead of the game yesterday and picked up a couple extra things, so there's no need to be lurking around any stores. The novelty of riding in the rain "because I can" has kind of worn off I'm afraid. 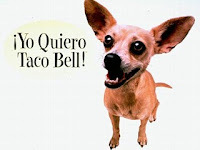 LOS ANGELES -- Handlers say Gidget the Chihuahua, whose Taco Bell commercials made her a star, has died. She was 15. Gidget suffered a massive stroke late Tuesday at her trainer's home in Santa Clarita and had to be euthanized. It was her bug-eyed, big-eared face that is seen pronouncing, in a dubbed male voice, "Yo quiero Taco Bell," Spanish for "I want Taco Bell." First Walter and now the Taco Bell dog. Somebody better hide the razor blades. Some days it's down to this. There it is, my big accomplishment for the week. I've managed to fill my groen afval (green waste) containers. There's a lot of bushes around this place that seem to be in constant need of getting trimmed, and the grass clippings alone can sometimes fill an entire container. At least these things will be emptied first thing tomorrow morning. On another note.....I like to compare living here with sailing. Long periods of relative inactivity interpersed with frantic goings on, since now we wait. We wait for our company to arrive on Saturday. We wait to hear when and if some sort of official word will be given as to our relocation. Can't very well make plans for a move without the ever important contract. The weather has been somewhat questionable the last few days, (like that's a surprise) so heading out too far on the bike is not really right up there on my list of things to do, so I've been keeping to store visits and that's about it. Besides, I don't even really feel like going over to the driving range. Maybe if we can go together later that might be an idea. The excitement is almost more than I can handle. ....Which will be slightly different from the previous "Vienna" post, since I'll put up a couple pics. We blew on outta Birmingham on Sunday afternoon after hanging around the mailbox area for a couple hours, getting a tad bored and deciding to cab it to the airport. We had dropped off the pool car late Saturday night since we were unsure of the parking situation at the hotel. Natually it was raining like crazy since well, we were still in England, and what trip to the UK would be complete without some rain? It's always best to have an umbrella pretty handy. Not sure that the guard at the gate quite knew what to do, but somehow after I handed over our "credentials", he was not only considerably more willing to have us put the car on the property, but at the last minute offered to drive the thing to some parking spot off in the darkness somewhere. For my part I really didn't give a rat's tiny behind since, once I had our stuff out of the car, he could have done with it as he pleased, and maybe he sort of figured that out too. The plane ride to Vienna was uneventful, but in hind sight we probably should have taken a cab to the hotel and gone to fetch the rental car the next day, (or even Tuesday) since finding the hotel was a bit of a challenge. This is the moment in time when you dig out the paper work and try and figure out just where we're supposed to end up. Oh and....note location of steering wheel. The car was a standard, but that's easy peasey for me, certainly if I'm only required to shift and start on hills with my right hand, and not my left. ..is the street that the hotel address is supposed to be on, but the entrance is way over on the other side. See any cars? Seems the address had been changed at some point in time, but nobody bothered to sort that out. Had I even been able to find it, this is what we would have found. No parking whatsoever, and their valet service had finished at midnight. So we left the car on the street three or four blocks away and I went out to fetch it Monday morning before 8:00 a.m. Parking overnight is doable in Vienna it turns out. On the up side, we did see a considerable amount of Vienna after dark, so that when we decided to do a little tooling around on Tuesday, a whole whack of it was already familiar to us. Günther...was coming by Monday morning at around the same time (8:00) to fetch Gabe, since they were heading up to a plant in Schrems to have a little look-see at the books and such, along with some glad handing and the usual introductory stuff. We're either fearless, stubborn or maybe a little dim. Not sure. If you click the link you'll notice that Schrems is nice and cozy with the Czech border, since there's a lot of back and forth it seems between there and the Czech Republic. Something about the cost of labour, but I'm not sure of all the details. Monday for me meant wandering around Vienna for most of the day, since Tuesday was going to be our day together to do a little exploring in some of the recommended districts to try and sort out just where we'd like to live. We more or less have an idea at this point, which does tend to help when dealing with the real estate agents. Always best to not let on how much you already know I find. Then at least they won't be carting us around and wasting our time in areas where we might feel somewhat less than comfortable, even though we never once felt we were in an area where the demeanor of the inhabitants made you feel like you were being given the once over. Tuesday was also Gabe's birthday, so she not only had the day off, but spent it in Vienna. That ain't too bad I guess. She was already wearing her birthday present, (glittery, and on a finger, OK?) but that's another story. What I haven't mentioned up to this point was that it had been pretty darned toasty in Vienna for the whole time we were there, and just as we were about to leave, the weather finally broke and a huge electrical storm came through. Oh and, where had we been for the first part of the trip? Right. England. It was cool there. I didn't exactly have "hot time in the city" clothing with me.....and thankfully the little car was airconditioned, which is why I spent most of the time in the car on that Wednesday. So fine, we're at the gate, where we've gone through security, so there's sweet bugger all in terms of amenities, and they tell us that, since the aircraft came through a storm, they need to give it the once over. Well that's just fine, since I'd sooner have the thing work properly, so a little delay wouldn't be a hardship. About an hour later, we get on the plane. Oh...they did bring us some "refreshments". Now here's the thing. By this point we're once again approaching the witching hour, and airports do in fact close at the end of the day. Not only was it required to check the plane, but they also needed to get the OK from KLM back at Schiphol. We waited so long at the gate, that they had to actually tow us out of there to free up some space. They were waiting for a fax to be cleared to leave. Who the blazes uses a fax machine anymore? Wouldn't you just send it as a pdf attached to a text and then if need be, print it out later and put it in your binder? Pretty sure that's what the pilot eventually decided to do, since he got fed up waiting for this mystery fax and got the word from HQ to go anyway. Over the phone!! By then you see, we're even later getting in to Schiphol so that, it was another good half hour to get the luggage off the plane and out to what was by then three flights waiting at the same carousel for their bags. Couldn't even get to the belt, even though our luggage was coming off "first", so I had to do what any old geezer would have done, and that was to tell one of the young snots crowding around in no uncertain terms to get my bag for me. He did what he was told before he even realised it. I had our bag and we were out of there. We just figured that everyone was "op vacantie", since half the work force is gone for the summer here anyway. We hauled our sorry selves into bed here at 3:45 a.m.
After getting what I think is the final dregs of the laundry done, then sweating it out for a couple hours in the garden and finally heading off to the Friday market for some salmon for tonight's dinner....I'm back. We left off with Friday's excursion out to Shrewsbury. I think it was a little over an hour's drive, but my memory's dim. I do remember that we came pretty close to getting stuck in traffic on the motorway, and getting into Shrewsbury proper was a bit of a challenge, since everything came to a standstill at that point. Seems one way streets were introduced a couple years back, and if you don't quite make your turn, it means going all the way 'round town to get back to the turn off point. We stopped and asked directions to the hotel, and the lady was going to jump in the back to take us there. Her more cool headed husband put a stop to that however. I had my suspicions that I "couldn't get there from here", but all I wanted to know was if I had to go out to the main drag and take another go at it. Turns out I did. Suffice to say we were on Raven Meadows (zoom in a bit) and we needed to be over on Butcher Row. They take your car away and park it....somewhere. They like to have forty five minutes lead time to fetch it again, so no clue where it ends up. This is a view up Butcher Row. That's the car waiting for us on the Saturday after we checked out. Decided to wander around Shrewsbury a bit. After checking in and getting freshened up, we headed off to The Quarry (check the map again) for the evening's festivities. We had tickets to a concert that night, along with the worker bees and their respective spouses from the Birmingham location of the company that cannot be named. and I must say, they did a fine job. Sorry, but I wasn't about to wade through that crowd to get a better image. You'll just have to squint. Someone had the good sense to rent chairs, tables and a shelter... ...since UK weather is oh so predictable. (these guys are no fools) Turns out the weather was just fine however, and we had enough food for at least twice as many people as were there. Now I should point out one minor item that I found a little strange. If you look closely at the above photo, you'll see there is a pavilion set up with a big picture of the Bluenose on the side? This is the sort of thing that just makes me go, "wuh...?" Apparently we could have won a trip to Nova Scotia! Is there some sort of market for tourists in the Shrewsbury area??? Can anyone explain this one to me? I took a pass on filling out a ballot. Now don't get into a snit. Yes, I would simply love to go, and we'll go back there at some point. It's a fabulous province, I highly recommend it, so shut up. Now here's something of which I had no clue. Turns out Shrewsbury is the birthplace of Charles Darwin. Not sure if that's why anyone would go there, but hey! he had a shopping centre named after him! Once again, I don't quite get the connection. Charles Darwin.....shopping centre. Is there some method of applying "Darwinism" to shopping? Does a Monty Python skit come to mind? I mean, if it's "survival of the fittest", what's really going on in there? We thought it best to stay outside. Just think if there were a whole chain of "Darwin Shopping Centres"! Shopping would take on a considerably different tone. And that, Ladies and Gentlemen, would be the best excuse ever to stay away from a shopping centre. I'm afraid I'll need to do a little catching up over the next little while, so please play along. There were times when I had wished I had taken along my computer on the trip, but it was just one more thing to lug, and Gabe was unable to get the "free wifi" in our room in Vienna, so I would have been frustrated anyway. Note: "free" usually means "crappy". I'm just saying. Yes, that's me at the wheel. And no, it's not some optical illusion created using some sort of mirror effect. And yes, it's raining. I was tempted to title this entry, "They're all on the wrong side! ", but decided to let that one go. This was actually taken on the Saturday night as we were making our way back to Redding's Lane to drop off the car. One of our hosts had very kindly offered the use of a gps which, when it's both dark and raining, (and you're in a foreign country and you're driving à la main droit) can be simply brilliant. Not sure what Gabe was attempting to demonstrate in this other photo, but what I see is me with both hands on the wheel. That also meant that I didn't feel slighted in the least that I was not offered a standard. By observing the cabbie on the route from the airport to hotel, I had been mentally preparing for the possibility that I'd be given a standard, (plus the usual observations concerning roundabouts etc.,) but not having to also shift with my left hand meant one less thing to deal with. Now admittedly, I don't think I'd ever drive in a place like Calcutta (who would want to?) but perhaps it's because I don't have a lot going on upstairs that made it fairly easy to do the "mental switch" to driving on the other side? Note comment above about not having one more thing to deal with however. It's a slightly freaky experience. I should point out the reason that we had use of this car, which was simply that it was one of the "pool" cars from the company that cannot be named, and we picked it up on the Friday afternoon after Gabe and I spent the day at the office. Since there was no possibility of using a remote proxy, my use of the internet was limited however to webmail and google maps. On the Thursday I had pretty much spent the day wandering around downtown Birmingham, imagining just how different life would have been had we decided to live there instead. Somehow though I think we chose wisely, even though the "mailbox" area of Birmingham is really quite nice, it is after all, the second largest city in the UK, and there have been other negative issues that have been pointed out to me. Just the same, for the first time in the last year, I'm in a foreign country, and all the signs are in English. Also kinda freaky. I think that's going to be about it for today. Just now an additional two mattresses arrived that had been mentioned by our Landlady last summer some time. They belong to a couple beds they had left behind that I'll now need to assemble. Company is on the way once again. The "Official news" can now come out, and that is that we are going to be moving here over the next few months. Probably sometime in September. Heading out this afternoon for the airport. Won't be doing the "long term parking" thing though, thank-you. I've been spending half my time this morning sorting out directions and maps here and there, since we need to go out to Shrewsbury for a gathering on Friday night. It's in Shropshire. Pretty sure I already made a reference to the "Shropshire Slasher" a while back. No such person actually exists. We'll be staying at The Prince Rupert. And for those who desperately want to track us down in the meanwhile, we'll be at the Ramada in Birmingham for tonight and tomorrow night. Meanwhile we've been getting our fair share of rain here this morning, which I probably wouldn't mention except for one minor thing. Parts of my skeleton has turned into some sort of human barometer. Once upon a time, I recall my dear ole' Mom making off hand comments like, "it must be going to rain". Now, I didn't really have any opinion about these types of pronouncements, since I just figured well, aren't middle aged people kinda goofy? Turns out she was referring to the pain in her joints. By this point the Tylenol has kicked in, but for a while there this morning, I could have sworn someone had taken a baseball bat to first my left knee, and then my right hip. I think there was a bit of a competition going on there. Now really, with today's modern weather gathering technology, I fail to see the need to be able to tell what's going on outside by the relative pain in my joints. C'mon! I realise that running around on concrete for the last say, 25 years? means that there are a few things that are starting to wear out, but I thought for sure I'd be well into my seventies before needing any replacement parts. Hopefully the drugstores don't run out of pain killers anytime soon. Getting back to the journey, there will be further snippets as the situation develops, but for now, that's about all I can comment on. I'm not carting this computer with me, so hopefully there will be something with a keyboard that I can use over the next few days. ...was pretty flippin' nice, as weekends go. The weather is even better today (Monday) but was just about perfect all weekend long. I'm only commenting on this, since I don't seem to have any problems complaining about never ending rain when we get it, so I figured some equal time was in order. Saturday morning, while Gabe was at the hair dressers, I decided to head over to the canal, since I had read in the Hofweekblad (the local rag, for those of you who don't read Dutch) that someone living over close to the canal was going to be launching a boat sometime after 10:00 a.m. I knew exactly where this boat was, since I couldn't help noticing the thing any time we biked along the canal. Seemed an odd place to store a boat. Now it makes more sense that he built the thing... I mean really? How would you not notice? I have no problems watching that kind of stuff, with the only exception that I probably should have taken one of our camp chairs, since it took the crew well over an hour just to set up the crane. I'm only guessing here, since I didn't have my watch on, but considering the actual hoisting of the boat out of the yard and into the water took all of 10 minutes, and I didn't get home until 12:00? They situated the crane on the bike path, more or less half way between this guy's back yard and the canal. Of course, having placed the crane directly over the precious bike path meant that there was a pretty good chance you'd have to stop and look anyway, even though there were a few passers by that I noticed who didn't seem too impressed with the notion that someone had blocked their way. These boys weren't fooling around when it came to having enough crane to do the job either. This was before they had put 50 tons of counter weights on the back. My guess is the boat displaced no more than five to seven tons, so there was no worries about anything getting out of hand. I'm sure the cost of the crane rental was a little mind boggling, especially since they had to bring the thing down from Groningen. We had originally planned to go to Zaanse Schans on Sunday, just to try and get in yet another touristy thing, but it meant sitting in the car for two hours to get there. When Gabe suggested we not go, it took me all of two seconds to agree. Oops. Maybe I should have thought about it for say, 10 seconds? I think she might have suspected that I really didn't want to go? Should have whined a little? Instead we went over to the driving range on the bikes. Took one club each, since really only one club is needed to work on your swing. I'll cautiously say that some progress was made. Well, if there are no injuries and no clubs are broken, that would probably be enough to settle on. I'm certainly no golf teacher, so any progress is met with unbridled enthusiasm. And that's as far as I'll go with that. It's been a tad on the warm side the last few days, but on Friday the weather finally broke, with the usual rush of air along with the ensuing rain storm. The flowers around the house seemed to have been doing OK in spite of no rain for at least a few days, but I'm sure a jolt of water didn't hurt. Now, I should mention that on Thursday night, after we got home from hitting the stores in Hengelo for "shopping night", the door bell rang. It seemed awfully late for anyone trying to put the bite on us for a donation, and it turned out it was our neighbour, who noticed that we "were still up" (forgot to close to front curtains...dammit) and stopped by to ask me if I wouldn't mind joining them on Friday morning to go over and sing Happy Birthday to one of the neighbours across the way. I have very little shame, so I agreed. Here we are at the street corner, after donning our hats. You'll note that there's no actual photo of me with a hat on. You'll never see one either. So along with the singing, it's also good form to bring along flowers. I took my camera instead. Not much of a punch line I'm afraid, but other than the rain storm in the afternoon, that was pretty much it as far as excitement on Friday. A couple things. First of all, the dentist appointment went surprisingly well. I mean, I would not have put money on that one. And....the timer for my sprinkler system was done. Can't remember exactly when it was installed, but I'm pretty sure it was just out of warranty, in spite of a seven year warranty period. Funny how that works? Put in a new one, and everything is getting watered like clockwork. It's been a few days now since getting back here to La-la land, but neither of us are "quite right" it seems. For my part, I still seem to be up half the night, only to crash about mid day. It's been kind of warm here the last few days, and the upstairs does tend to get too warm for sleeping, so that doesn't help either. Hence, no huge desire for blogging. Didn't figure any one's life would be put too much on hold as a result. Not sure how to put this and I don't want it to come off the wrong way, but it was rather nice to come home on the much smoother Dutch roads after we got here Sunday morning. The difference is truly astounding. Well, to be completely fair, there was also a huge difference between loping along in a Jeep Wrangler (no worries about breaking any speed limits either) and getting into the A6. How should I put this? Let's just compare riding a jackass into the Grand Canyon with say, taking a thoroughbred around Woodbine? I'll let you figure that one out. Now I realise they don't get the deep frost issues here that we get back in Canada, but really, planned obsolescence when it comes to road building is not the way to go. They do in fact get frost here, and there's gobs of truck traffic, but the roads do seem to hold up just fine. Better built maybe? Could it be 'cause our all knowing government types are forever going with the "cheapest bid"? Just a thought. Too complicated an issue to get into it here. Yes, the cost of living is heaps higher here, but sometimes it seems you gets what you pays for. I think I have the perfect example that has nothing to do with the roads, but is oh so telling when it comes to some fundamental differences between North America and Yurp. Here you have it: Yes...that's a clean toilet. Just about the first place I head for when getting off a plane is the washroom. That means I had to visit the facilities in both Newark and then Toronto. Good grief! I think the one in Toronto had just been "cleaned" and it was still pathetic. Boy, I sure knew I was "back home"! Mind you, if you saw just who they have cleaning their washrooms, you might get the idea that different cultures perhaps have a different take on what "clean" actually means, but we'll not get into any sort of racial profiling here. It's not like you have to pay to go to the washroom at Schiphol, like you do at most all gas stations, but they're still spotlessly clean. Now you might say, "but I can go into any public washroom in North America and not pay a dime!" But really, why would you want to?? This was one of the things I really enjoyed about motor home travel. I always knew who used my washroom last. Had he bothered to come by, he might have actually been able to collect the gobs of mail in our box. I think more than half of it was not ours. Don't mean to be petty, but I'm in no hurry to deliver their mail. Maybe they're on vacation? Who knows?